Does a new class of drugs derived from “humanized” mouse DNA offer promise for long term management of chronic auto-immune disease? As early as 1997, drug development scientists were touting a new biotech class of drugs known as monoclonal antibodies that use mouse DNA in its production. This article discusses the dangers of long-term monoclonal antibodies (mAbs) use and compares their efficacy to naturopathic treatment such as food prescriptions and treatments utilizing nutraceuticals like cannabidiol (CBD). I’ve been a bit of a “Football Wife” this weekend and took note of not one but two Mab-based drugs being advertised on TV for the long-term treatment of Ulcerative Colitis (UC) and Crohn’s Disease. What you need to know is that the technology that underpins drugs like Infliximab, Adalimumab, Humira, and Entyvio relies on foreign proteins derived from mouse DNA and there is no biotech product on the market today that can be safely used for long term management of UC or Crohn’s. The idea that a life-long, chronic condition can be fixed or controlled with a Mab is disingenuous, I describe why below. TV commercials showing UC sufferers eating movie popcorn or pepperoni pizza do the public a disservice: it says you can eat the Standard American Diet (SAD) and still manage your symptoms by taking dangerous, immune suppressing, drugs for life. Naturopathic doctors have proven strategies for dealing with UC/IBD/Crohn’s and other auto-immune diseases like Multiple Sclerosis (MS). Naturopathic treatments boost and modulate your immune system and target inflammatory pathways, instead of suppressing the immune system with mouse antibodies. Biotech drugs based on Mab technology work by suppressing the immune system, which is why all mAbs require dire warnings on the labels about how they open you up for opportunistic infections often only seen in highly immune-compromised individuals (see the insert warnings). Immuno-suppression is not a long-term solution for management of UC or Crohn’s disease. – mAbs are bio-engineered products, long term use of mAbs has been shown to induce immunogenicity in humans which means that, after repeated treatment, your body will label the mAb as ‘other’ and reject it. This flaw been known for a long time and this well cited paper admits openly that scientists still can’t predict how a mAb will be tolerated by the body, despite repeated attempts at ‘humanization’ of the mouse proteins that underpin Mab technology. -UC, IBD, Crohn’s can be managed by most people with intensive diet prescription, lifestyle, stress reduction, mindfulness practices on top a nutraceuticals such as probiotics, CBD and Robert’s Formula. -MS is also an auto-immune disease and this MD has documented how the paleo diet can be an effective treatment for MS.
-The root cause of many diseases is inflammation. By reducing inflammation, the bodies self-repair mechanisms can do their job best. Here is a study that shows how cannabidiol (CBD) can reduce inflammation in the gut A mechanism of action for how CBD can help people with UC/Crohn’s/IBD is best understood when looking at how the brain communicates with the gut to either start or stop an immune response. -The “microbiota gut:brain axis” represents the neural tissue and microbes that reside in our abdomen and produce ‘gut feelings”. The size and diversity of neural tissue in the gut is astounding, and this system communicates back to the brain via the endocannabinoid system (ECS). CBD has been shown to work within the ECS to reduce inflammation and modulate the body’s immune response positively. Recent advances in science shows that your gut contains large amounts of neural tissue that connects through the microbiome to represent the gut:brain axis that decides if the body will label a foreign protein as ‘other’ and how much, if any, of an immune response to initiate. You can read further down if you want to geek out on immunology and learn the history behind how scientists bio-engineered mouse DNA to produce the class of immune modulating drugs known as monoclonal antibodies (mAbs). You need to understand a key concept: immunogenicity and how this renders Mab treatment ineffective in the long-term, but describes how the very drug meant to cure you can evolve to become a toxin to your body. Immunogenicity is the ability of a particular substance to provoke an immune response. This may be a wanted response as in vaccination or an unwanted response, as when your body rejects a certain drug, like one made with mouse antibodies. Monoclonal antibodies (mAbs) have promise and proof as a cure for a host of diseases from cancer to MS. Biotech drugs made from monoclonal antibodies are no doubt effective for acute human disease, but their effectiveness wanes over time. Monoclonal antibodies can be particularly effective for treatment of acute diseases like cancer where therapeutic agents are usually applied over short duration/high intensity treatment. For treatment of chronic diseases like MS, UC, or Crohn’s, mAbs are being marketed to consumers who may require long-term therapy measured in years. Used for long duration, mAbs become ineffective and open the body up to serious infections. 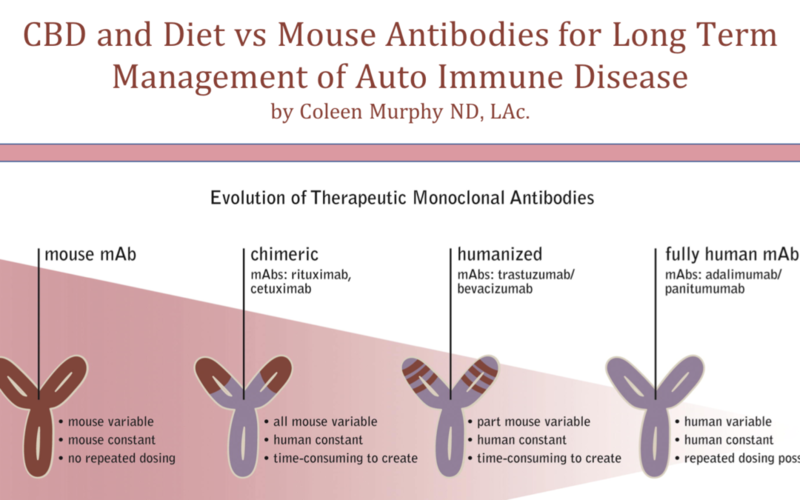 Studies published during the emergence of monoclonal antibodies in the late 1990’s discuss how mouse antibodies were ‘humanized’ to produce a new class of drugs known as mouse derived monoclonal antibodies. Jumping ahead ten years, researchers discuss the advances in technology that allow for the production of even more “humanized mAbs”. Advances in tech allowed for a move away from the “Murine” model where the DNA is basically 2 strands of mouse and move toward a chimera where one DNA strand is human, one mouse. In this ND’s opinion, and no amount of ‘humanization’ is going to fix the Mab problem with immunogenicity. The use of mAbs as a substitute for diet and lifestyle modification is flawed thinking that starts the cycle of immune suppression, disease, more drugs, surgery and poor quality of life. Monoclonal antibodies have their place in the canon of allopathic treatments, but their marketing as a long-term fix for chronic problems is not supported by the science. You can’t suppress your way out of UC/Crohn’s/IBD treatment, but you can treat it naturally with proven therapeutics and a ‘food as medicine’ prescriptions that your naturopathic doctor makes unique to your condition.